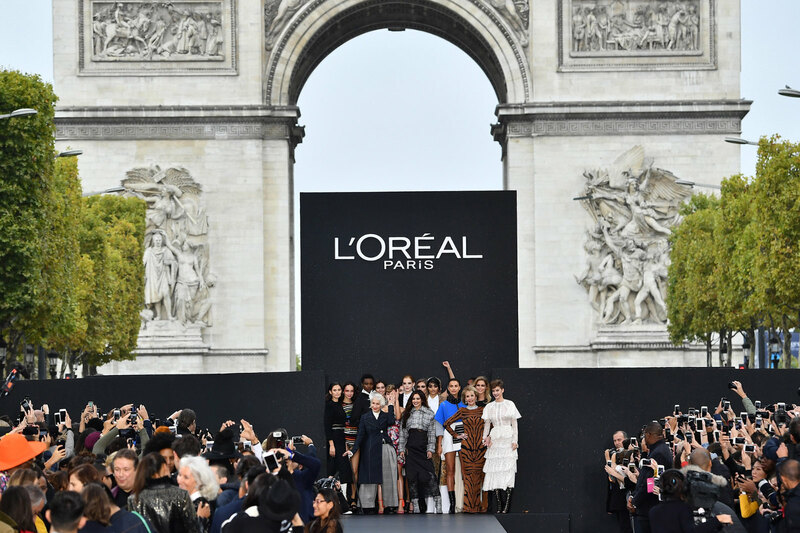 L’Oréal Paris has the budget for spectacle, and it literally stopped traffic with its latest newsmaker on Sunday: a fashion and beauty runway show right in the middle of the Champs-Élysées, where its ambassadors Alexina Graham, Barbara Palvin, Bianca Balti, Cheryl Cole, Doutzen Krœs, Jane Fonda, Dame Helen Mirren, Irina Shayk, Lena Meyer Landrut, Liya Kebede, Li Yuchun, Luma Grothe, Maria Borges, Neelam Gill, Soo Joo Park, Taliana Vargas, Thylane Blondeau, and Valentina Sampaio walked the catwalk, alongside Giedre Dukauskaite, Vanessa Moody, Adwoa Aboah, Alpha Dia, Marcus Butler, Vincent Lacroq, Stefanie Giesinger, Mali Koopman, Chiharu Okunugi, Nadja Bender, Grace Bol, Tessa Kuraji, Katlin Aas, Myrthe Bolt, Aiden Curtiss, Mélodie Vaxelaire, Fabienne Dobbe, Damaris Goddrie, Estelle Chen, Iskra Lawrence, Ysuanny Brito, Josephine le Tutour, Valery Kaufman, Hyunji Shin, Rina Fukushi, Chané Hüsselmann, Maartje Verhoef, Benoît, Erik van Gils, Max Fieschi, and Winnie Harlow. The big names didn’t stop there, for why wouldn’t you attend a show staged on the biggest street in Paris? In the 645-strong audience were Naomi Campbell, Jon Kortajarena, Aymeline Valade, Luc Besson, Laurent Bourgeois, Larry Bourgeois, Peter Brant II, Noemie Lenoir, Alain-Fabien Delon, Arizona Muse, Kristina Bazan, Cindy Bruna, Marie-Ange Casta, Jasmine Sanders, Inès Rau, Petra Němcová, Francisco Lachowski, Miss Fame, Val Mercado, Crystal Murray, Thaïs Klapisch, Annabelle Ferrera, Angelina Woreth, Kiddy Smile, Luis Borges, Renan Pacheco, Olivier Rousteing, Alexandre Mattiussi, Haider Ackermann, Olivier Theyskens, Joanna Senyk, Cedric Charlier, Elie Saab, David Koma, Loïc Prigent, Mademoiselle Agnès, Louka Meliava, and Catherine Loewe. Le Défilé L’Oréal Paris was a once-in-a-lifetime show, displaying the latest fashion, hair and make-up looks. Nineteen designers participated (current-season offerings from AMI, Ashi Studio, Balmain, Cedric Charlier, Courrèges, David Koma, De Fursac, Ellery, Emanuel Ungaro, Giambattista Valli, Haider Ackermann, Isabel Marant, Mulberry, Off White, Olivier Theyskens, Pallas, Pierre Hardy, Sonia Rykiel, and Wanda Nylon), with Chopard providing the jewellery exclusively. Supporters could also watch the show online. L’Oréal Paris make-up artist Val Garland and hairstylist Stéphane Lancien were among those responsible for the looks, showing off their ideas of Parisian beauty. The audience could also enjoy a masterclass where the runway looks were re-created in cabins on the Champs-Élysées, on the pavement near the catwalk, and check out the latest products.